DMCA takedown notices from copyright holders. The report shows that the U.S. government has asked Twitter 679 times to reveal user information since January 2012, followed by Japan with 98 and Canada and the United Kingdom with 11 requests each. 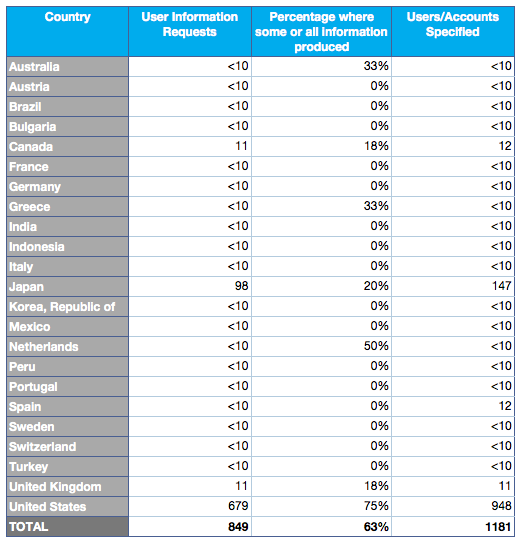 All other countries listed in the report asked <10 times to reveal user information. In response to government requests to remove tweeted content, Twitter removed content 0% of the time. A compendium field guide for practitioners will be published a month later. I co-authored the field guide with Bill Greeves and it is also available for preorder on Amazon.com. My “Gov 2.0 Revisited: Social Media Strategies in the Public Sector” article won the PA Times’ 2010 H. George Frederickson Best Article Award. “I am very honored to accept the PA TIMES Best Article Award for 2010, and would like to thank the award committee for their hard work in reviewing what were undoubtedly a large group of high quality submissions. Government 2.0 is not only a hot topic at the moment, it is an important one. I believe that the use of social media applications is at a tipping point, moving from early innovators toward broader acceptance among government professionals. These technologies often challenge the way that public employees conduct their work, but as the use of Government 2.0 grows we will observe more changes in the way information is organized and distributed, as well as in the way information is co-created by citizens and absorbed by government. In this early stage of Government 2.0, the use of social media in the public sector is often labeled as the “Wild West of e-Government.” However, we are beginning to move into a convergence phase–where the reality of government operations merges with the new reality of social networking services: both will have to adapt to these new challenges. What is missing is clear guidance on best practices and acceptable strategies for effectively using social media applications to support the missions and practices of government organizations. The interviews I conducted with current social media directors for this PA TIMES article highlight not only challenges and hurdles, but also the positive impacts so social media can have in the public sector. 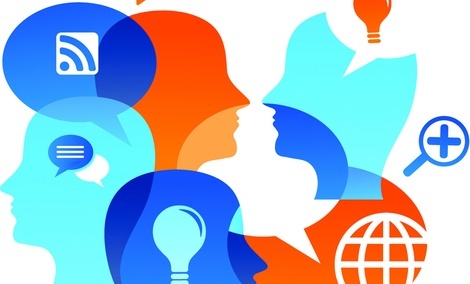 Government is already part of the public conversations that are happening on social networking sites; therefore, public managers need to understand where and how these conversations evolve–and become a part of them. Mergel, I. (2010): Government 2.0 Revisited: Social Media Strategies in the Public Sector, in: PA Times, American Society for Public Administration, Vol. 33, No. 3, p. 7 & 10. Mergel, I. (accepted for publication): Government networks, in: Encyclopedia of Social Networking, Editors: Barnett, George, Golson, J. Geoffrey, Sage Publications. Mergel, I. (2010): The use of social media to dissolve knowledge silos in government, in: O’Leary, R., Kim, S. and Van Slyke, D. M. (Editors): The Future of Public Administration, Public Management and Public Service Around the World: The Minnowbrook Perspective, Georgetown University Press, pp. 177-187. Bretschneider, S. I., Mergel, I. (2010): Technology and Public Management Information Systems: Where have we been and where are we going, in: Menzel, D.C., White, H. J.: The State of Public Administration: Issues, Problems and Challenges, M.E. Sharpe Inc., New York, pp. 187-203. I reviewed social media policies and strategies of public sector organizations that are freely available on the web or were distributed during the last two years on Twitter (see hashtag #gov20). Especially after GSA has published the Terms of Service Agreements with most major SNS, I have observed a major uptake in formal written statements outlining why, how and for what purposes agencies and departments are using new media. I included local, state and federal level public sector organizations in my analysis. Even though it seems as if a legal framework was created by GSA’s Office of Citizen Services, I observe a wide range of different documents and statements as a result. A handful of documents is labeled “Handbooks” (such as the Navy Command Social Media Handbook), Toolkit, Social Media Computing Guidelines, or Business Uses of Social Networking Services. These types of documents usually describe best practices and recommendation on how to use different tools such as Twitter or Facebook. They are usually very lengthy, true handbook-style documents. In addition, 1-page policy-style memos come in the form of directives, “rules of engagement”, use policies or even “Social Media Law”. Only one organization actually wrote a social media strategy document that looked at how the new channels fit into the existing communication strategy and how they can support the mission or public service delivery. I have extracted the major themes that the public sector organization I analyzed covered and will post my preferred content of a social media policy/strategy document in the next post.